Here are 25 the best yo mama jokes ever made that will make you howl with laughter. Do you know a funny yo mama jokes ever? …frustrated? trapped? bad mood? I hope these yo mama jokes make you laugh, happy and free from stress! 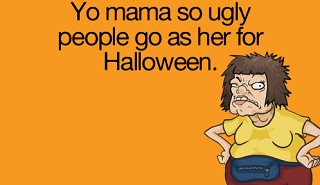 Yo mamma is so ugly when she tried to join an ugly contest they said, "Sorry, no professionals. Yo mamma is so fat she doesn&apos;t need the internet, because she&apos;s already world wide. Yo momma&apos;s so fat she needs cheat codes for Wii Fit. Yo momma&apos;s so fat, she got baptized at Sea World. Yo momma&apos;s so fat, she wore a black bathing suit to the pool and everyone yelled "oil spill!" Whomever it was best yo mama jokes, first, we’re sure glad he did. Here are our favorite "the best yo mama jokes ever made". Feel free to add yours to the list in the “Comments” section!